We build and operate internet businesses that make money for broadcasters and content syndicators. Our clients have no out-of-pocket expenses. They earn a substantial share of the revenues their sites generate. Our websites feature compelling audio, video, text and image content posted each day by our clients. We work closely with each of our clients to assure strong revenues derived from the sale of premium membership subscriptions, newsletters, webinars, books, merchandise and advertising. Trusted by some of the biggest names in the broadcast industry for over 15 years, we've generated millions of dollars for our clients. With close to 250,000 subscribers and 850,000 merchandise orders processed last year, we are the largest independently operated content publishing and e-commerce provider serving the broadcast media industry. 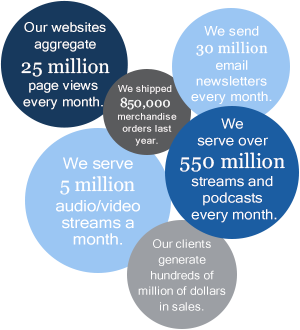 Our proprietary enterprise-grade platform delivers over 550 million streams and podcasts, 25 million page views and 30 million emails every month. Our success can be attributed to our customer-centric management philosophy. Simply put, you come first. Our CEO is available to every client 24/7. We help you build your brand. By presenting your audience with a high quality, content-rich website, you extend your brand in new and exciting ways. We help by providing you with a feature-rich website, which enables more content to be offered in more creatively. We enable your audience to interact with your innovative content, 24/7. We provide our clients with a powerful online platform they can use to present audio/video content, text, images, listener-generated content, podcasts, clips from radio or television shows, clips from YouTube and more. Our websites are rich with features that enable our clients to interact with their audiences online with blogs, polls, webcasts, message boards, links to social networks, etc. We help you enlarge your audience. With a full-featured website, you have an opportunity to connect with millions of potential listeners all over the world. By marketing your site using search engine optimization, email, Ad Sense and other techniques, more people will discover you and your site when they are doing searches online. We know what we're doing. We bring knowledge, infrastructure and expertise drawn from over 15 years of marketing "paid content" and merchandise to radio and television audiences online. We operate a successful end-to-end e-commerce system for the sale of premium membership subscriptions, content downloads, newsletters and merchandise. In addition, our platform includes an advanced online content publishing system. With our operational expertise, your website will no longer cost you money -- it will be a profit center to you. We do all the work and we take all the risk. Our clients have no out-of-pocket expenses when they work with Nox. We build the websites, manage the marketing, process the credit cards, provide the customer support and all other functions needed to be successful. Nox makes you money. Our clients earn a quarterly royalty whether we're making money or not. There is no risk to our clients when they work with Nox. Our clients earn income from day one.